Focaccia remains up there in my top breads, in terms of making and eating, and while a standard focaccia is a delight, I love experimenting with flavours. This focaccia, made with utter ease and minimal effort in a mixer, is laden with gorgeous salty anchovies and the lovely sweetness you get from slowly cooked garlic and onions. 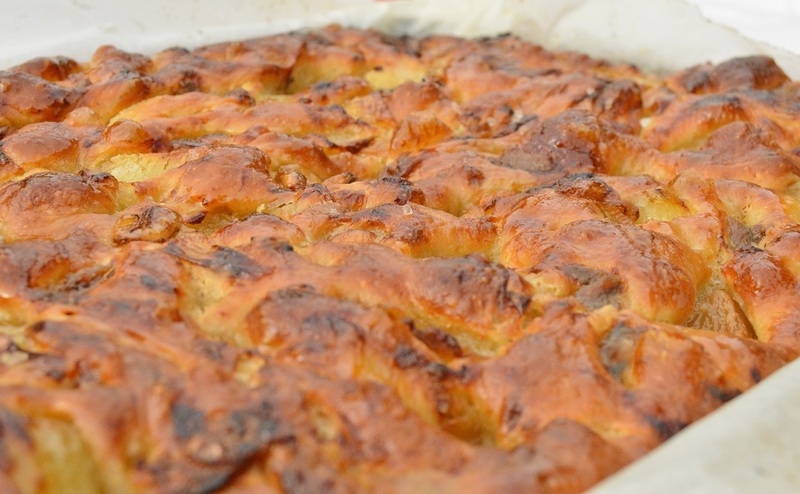 Quite simply, it is a focaccia with attitude! If you are not a fan of anchovies, simply leave them out – or replace then with small cubes of Parmesan. 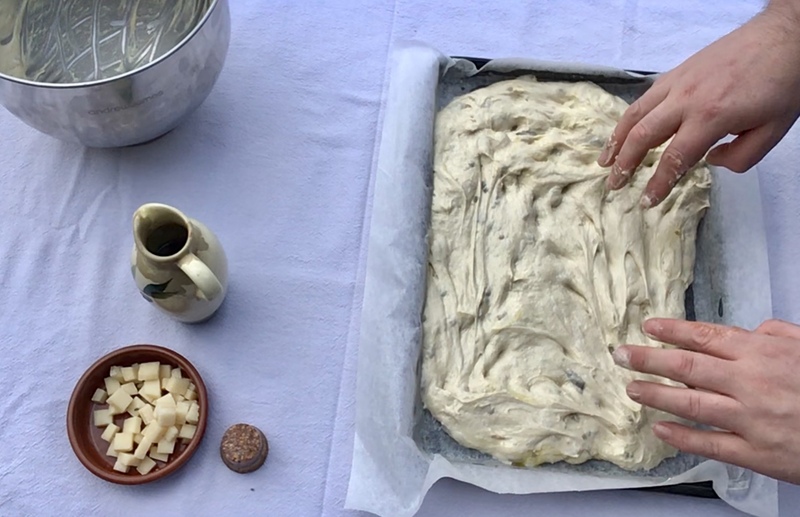 I have a mini video demonstration of making focaccia similar to this on my YouTube channel: the video can be found here. 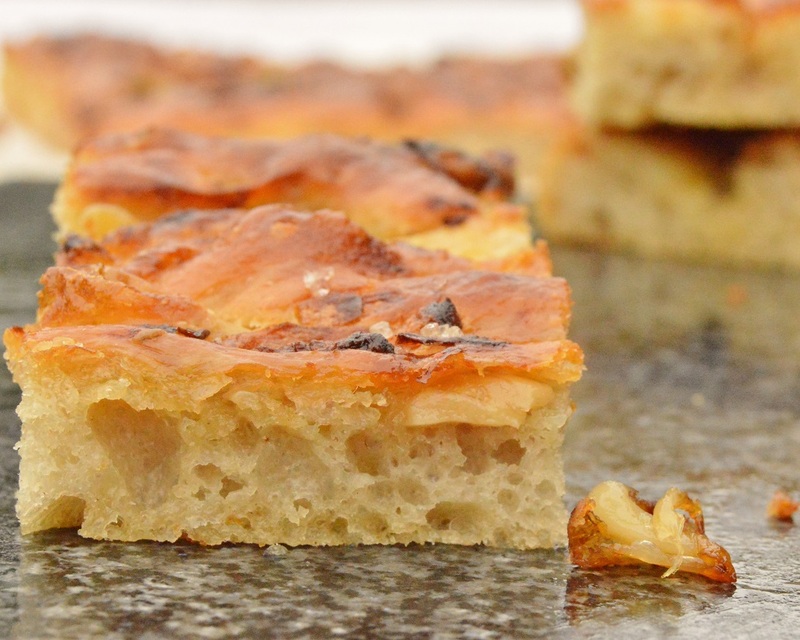 The challenge for a great focaccia is the hole structure: you want it to be laden with holes of small to large sizes rather than dense and doughy. A high water content in the dough is key – this does make it harder to handle, but to be honest the use of a food mixer makes this almost effortless. Once you have roasted the onions and garlic* you literally put all of the dough ingredients into the bowl of a food mixer and then, with the machine on medium-high, let it do its thing for about 20 minutes. 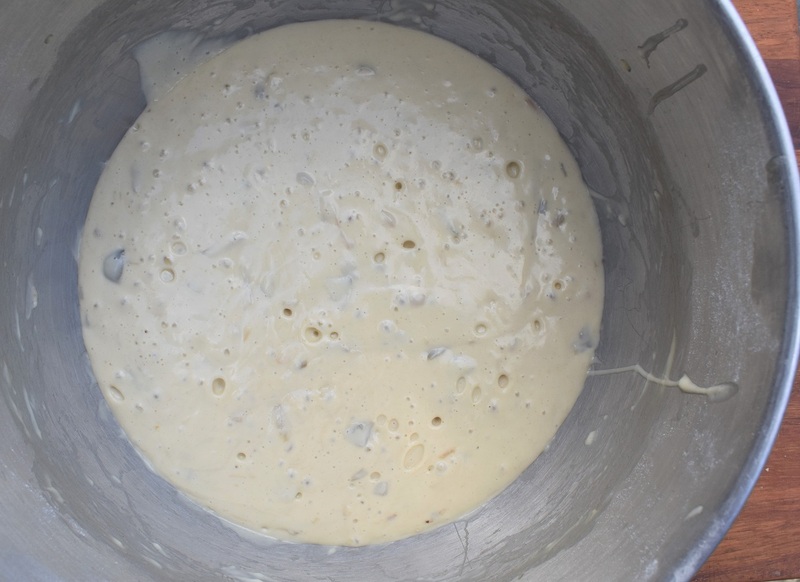 The dough is then left to ferment slowly, before being shaped, allowed to rise, and baked. I let the dough rise slowly at room temperature once it has been made up and kneaded, which gives a better flavour, but for an even better flavour, pop the dough in the fridge for an overnight rise (in which case you can even reduce the yeast content to 3g). 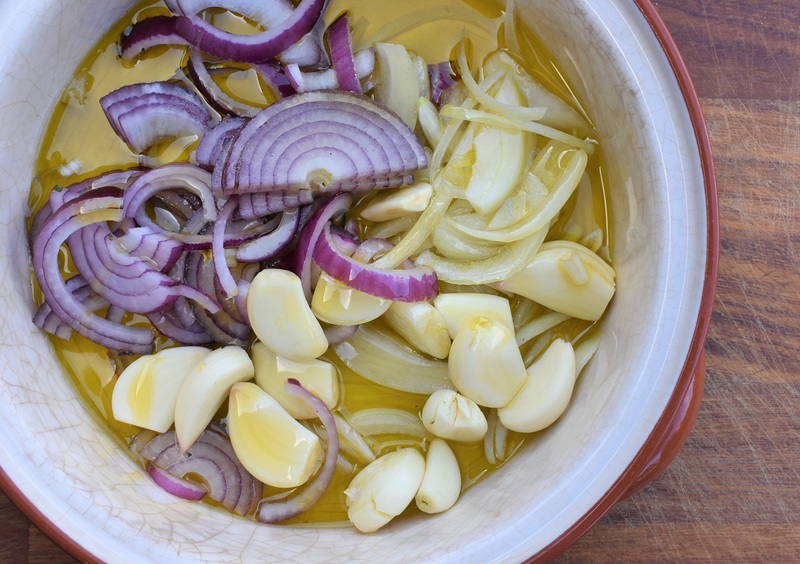 *if you don’t want to roast the onions and garlic, you can chop them finely (or even blitz them in the food processor) and add them, raw, to the flour at the start: you won’t get the lovely sweetness and the roasted flavour, but you will get a nice flavour running through the focaccia. (1) Roast the onion and garlic: put them, along with the oil into an oven-proof dish. Cover and roast in an oven pre-heated to about 150C (fan) for up to an hour until the onions and garlic have softened and have started to turn golden brown. Cool. (2) Add the flour, salt and yeast to a large mixer bowl. 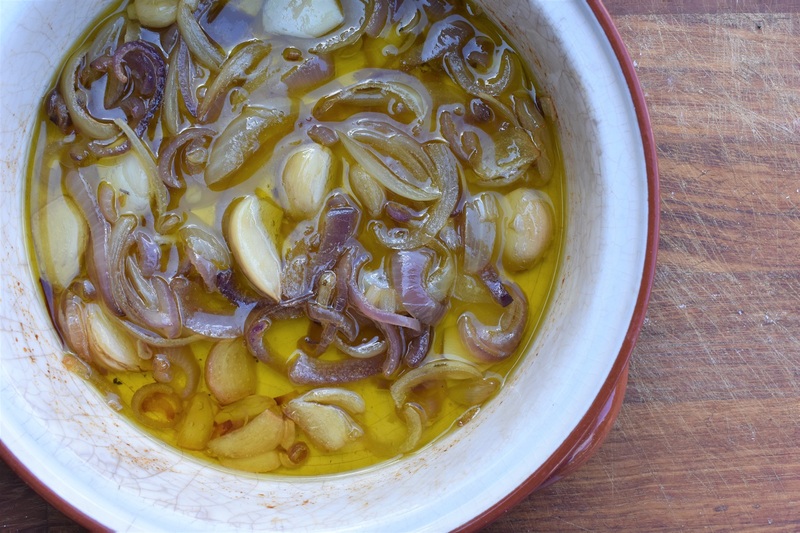 Add the anchovies and the cooled garlic and onions, along with the oil. 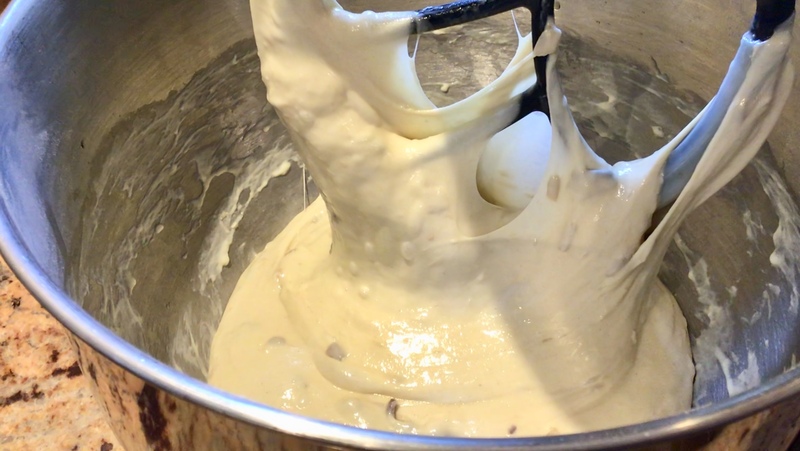 Pour in the water and mix with the paddle or whisk attachment for about 20 minutes on a medium speed: the dough will become silky-smooth and almost gelatinous in texture. (3) Cover with clingfilm and chill for several hours until well risen and very bubbly: ideally, though, go for an overnight rest in the fridge for an even better flavour. 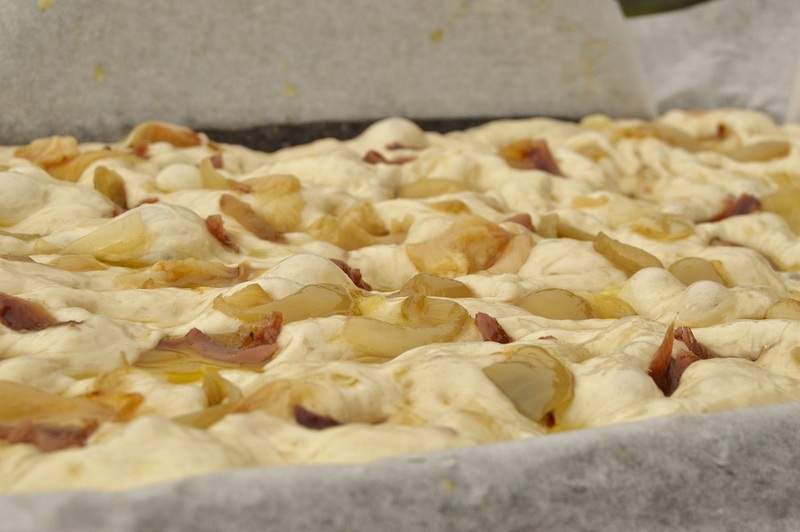 (4) Pour the dough gently onto a large shallow baking tray lined with non-stick greaseproof. Gently ease it into the corners. Drizzle over a little olive oil and leave for an hour or so at room temperature until well risen: it will have many tiny bubbles over the surface. Towards the end of the rise, pre-heat the oven to 200C(fan). NB: you do not need to cover this dough as it rises as the oil will ensure the dough does not develop a skin. (5) With oiled fingers, make dimples all over the surface, through some of the onions and garlic and going right down to the greaseproof. Drizzle with a little more oil and sprinkle over a some sea salt (not too much because of the anchovies). (6) Bake for 20-25 minutes until a deep golden brown colour. Remove the focaccia from the oven and drizzle over a little more olive oil. Leave to cool before slicing and devouring. Wow that texture is amazing!! I saw your recipe on Tasty Tuesdays. 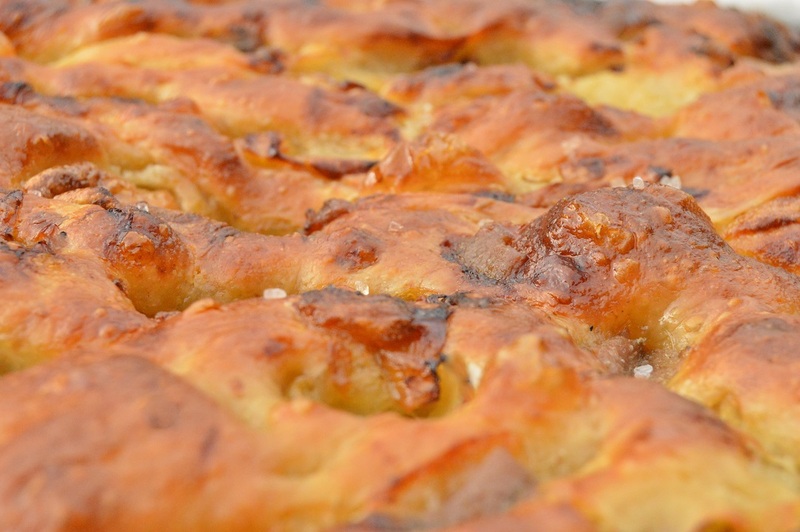 I’m a huge fan of focaccia and yours looks beautiful! The flavour combination sounds so yummy too.